Even though we're still in November, Christmas is already in full swing in shops up and down the country, as well as on my blog! 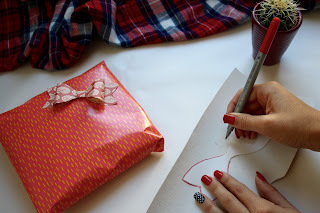 I've already shared a delicious Christmas cookie recipe which you all seemed to enjoy, so today I'm here with another crafty activity, allowing you to create gorgeous DIY Christmas wrapping. 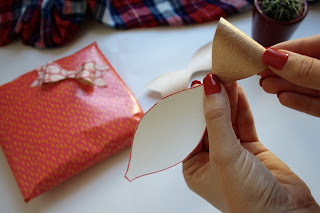 I learned how to do this myself at the recent Jingle Mingle blogger event hosted by the lovely people at PrezzyBox, and the results are so effective that I think you'll be BOW-led over by them! You've guessed it, I'm going to teach you how to create these gorgeous (and very professional-looking, if I do say so myself) bows for your Christmas gifts! 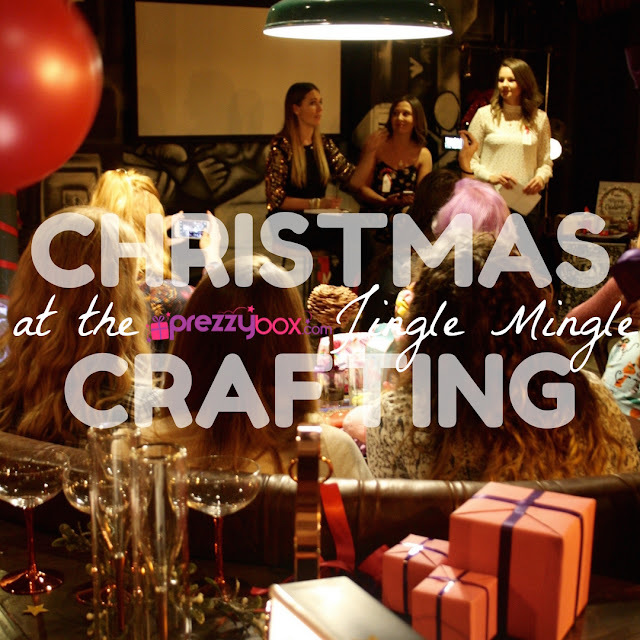 This festive craft activity was just one of many on offer at the PrezzyBox Jingle Mingle, but more about the event later! Let's get stuck in to the tutorial! 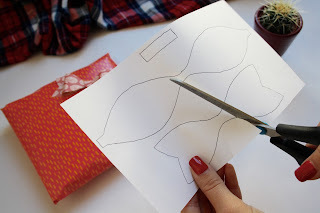 Step One: Grab your printout of the bow template and cut out the three pieces. You should have a small rectangular tab, an hourglass shaped piece, and a bow base piece. Step Two: Lay your chosen coloured paper face down on the table and trace around each of the template pieces you've just cut out. Then cut the shapes out of the coloured paper. You can use pretty much any coloured paper you like for this, I used a leftover scrap of a wallpaper sample that I picked up from Homebase! Step Three: Take the hourglass shaped piece and fold the small tabs on the outer edges in to the middle and stick them in place, as shown below. Step Four: Once you've stuck both outer pieces into the centre, take the small rectangular tab and wrap this around the middle, sticking it down at the back the tape it won't be seen. You should now have the beginnings of your bow! Step Five: Take your bow and stick it to the remaining bow base piece using double-sided sticky tape. Ta da! 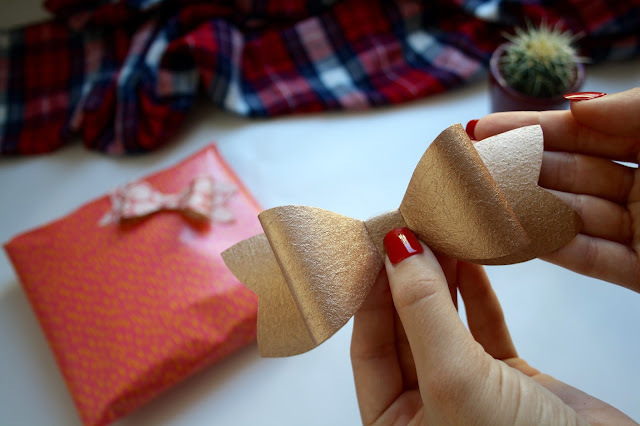 Your bow is now ready to stick to a gift of your choice! I bet that was a lot easier than you thought, right? 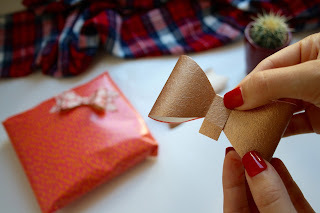 I had such fun creating these at the PrezzyBox event that I just had to share them with you all, I will definitely be making some more bows when it comes to wrapping my Christmas gifts (is it bad that I haven't even started shopping yet? Eeeek). 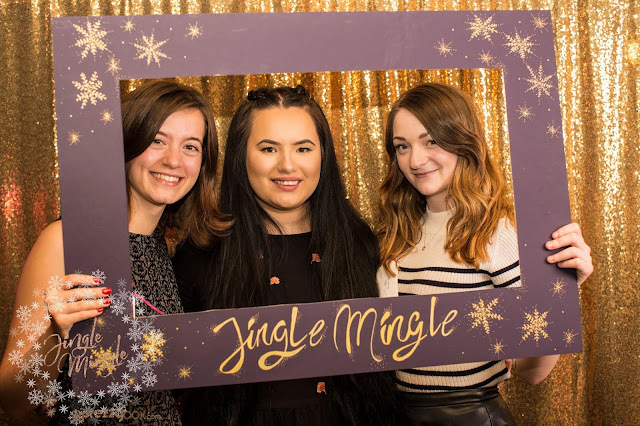 As well as the crafting table, us lucky Jingle Mingle attendees were treated to a perfume making workshop courtesy of The Perfume Studio, plenty of prosecco and nibbles courtesy of the hosts at Baresca Nottingham and a talk by popular YouTuber Talk Becky Talk. It was a lovely opportunity to meet the PrezzyBox team, check out some of their products, as well as meeting other bloggers! I was lucky enough to get to hang out with Debra and Chloe all night, as well as meeting Laura, so I had a wonderful time! It was also great to see a big brand hosting an event in the East Midlands - London seems to be the most popular location for blogger events, I get invited to so many in the capital that I'm just not able to attend because it's not convenient for me to travel, so I'm hoping that many other brands follow PrezzyBox's excellent example and start hosting events for us Midlands gals too! A little shoutout also has to go out to KISS Nails and to Alex Silver PR, for sending me the gorgeous stick-on nails that I wore to the PrezzyBox event, and in the photos for this tutorial. They're super glam, easy to apply and I absolutely loved mine! Definitely check them out if you're looking for some snazzy claws this festive season. How are your preparations for Christmas coming along? 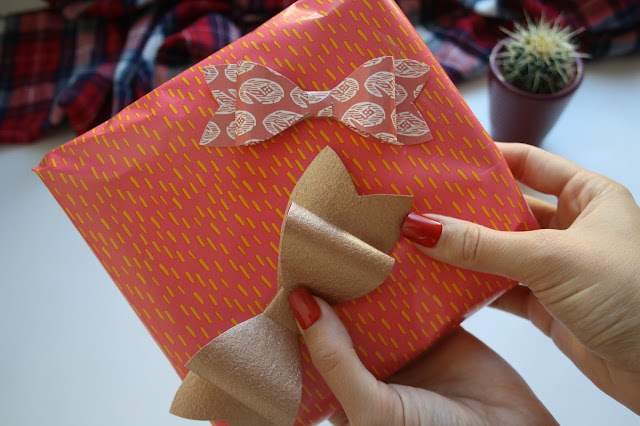 Have you started wrapping gifts yet? Let me know in the comments!